Yes, really. Alex and I are making sausages with sauerkraut for dinner, and had half of a bag left over. I was playing around on epicurious to get some ideas, and found this recipe. Genius! So I threw it together (seriously, about 2 minutes), fried them up in some oil, and ate them up. I am glad I only made four because I could have eaten a whole lot more than the two I ate. Heat 1/4" oil in a frying pan. Combine sauerkraut, egg, salt and pepper, and flour mix in a bowl with your hands. Form patties, squeezing out any excess liquid. Fry latkes, browning well on one side, then flipping and browning on the other. Serve with apple sauce. I love sauerkraut! Can't wait to try these. Oh, those look very nice! What a great idea! Very creative. Yum! I'm all about some sauerkraut. Wish others in the house loved it too though, but maybe this way, there'd be more for me! I LOVE sauerkraut and this is a new way for me to eat it. Thanks for posting the instructions on how to make it! I can only imagine how good this tastes. Do you use rice flour with it or something else? Pure genius! I am off to make some right now - thanks for the idea!!! i absolutely hate Sauerkraut, but the Sauerkraut Latkes are delicious, and very unique. We tried these and they were delicious! I had to explain to my southern husband what they were (it's like a potato pancake with sauerkraut instead of potatoes). My 10yr old loved them. They aren't as tangy as the plain sauerkraut but there is a bit of that tang still there. YUM! We will be doing this again (in fact my husband asked me last night what was in them because he was thinking about making them. Finding the right gf flour was what stopped him). These look delicious! 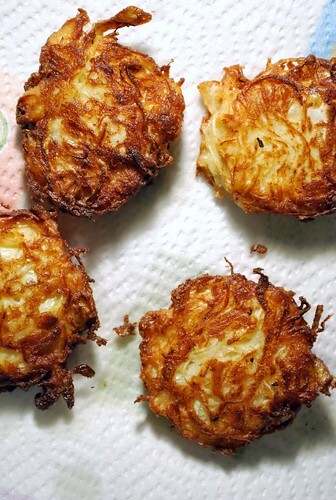 I've been looking for a latke recipe for a while now. I adore sauerkraut and including it in any dish is really nostalgic for me. Thank you for sharing!